Mix three cans of soup, rice, and water in dutch oven. Arrange chicken pieces on top of rice. Bake for 75 minutes at about 350 degrees. Check every 20 minutes - add more water if it seems to need it. 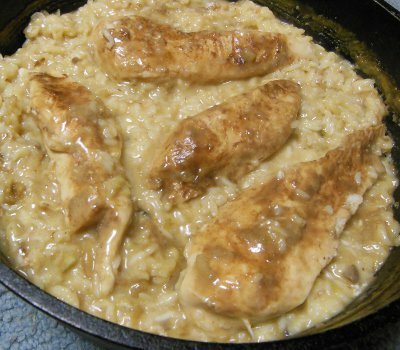 Let me know how you enjoyed your Creamy Chicken Rice! Great recipe. I do a couple of minor changes. 1. I brown the chicken in the Dutch oven first so the skin is crispy. 2. I substitute chicken broth for some of the water. Neal Hand, if you do it this way, you can leave the lid on. @Neal - The lid should always be on the dutch oven unless a recipe says otherwise. I like Troy's idea to brown the chicken first.